Easily their heaviest release to date, “Seance Prime” was recorded by Kurt Ballou (Converge) at Godcity Studios. “Seance Pr…see site for more info. 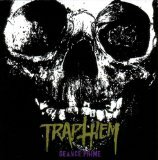 I bought this album, having not heard “Trap Them” and was pleasently suprised! They have quickly become one of my favorite Deathwish bands. It’s pure brutality throughout the entire 15 or so minutes that this album lasts. It’s a definate must have for any fan of the genre!